This is Tomás Ó Criomhthain. He was born on The Great Blasket Island off the westernmost end of Ireland's Dingle Peninsula. The island's an isolated place, hard to access and often cut off from the mainland for weeks by fierce Atlantic storms. There's a story that its people took refuge there from invasion and land grabbing on the mainland. The community they built believed that it preserved a cultural inheritance that held lessons for the world. The photo was taken sometime in the mid 1930s and the book in Tomás's hand was written by himself. Writing was not a part of the Blasket islanders' culture. In their oral tradition the knowledge, skills and beliefs that made up their worldview were passed from generation to generation by word of mouth. They were farmers and fishermen, musicians and storytellers, whose community depended for survival on a deep, shared understanding of their environment and a vivid sense of spiritual awareness of their own place within it. By the time the photo was taken, the community was in the process of dying. The lure of an easier life in America and elsewhere, combined with lack of government support and respect for their way of life, had begun to draw the young and the strong away from their island home. As the number of households on the island dwindled, members of the older generation, like Tomás, came to terms with a fact that, to them, must have been fraught with irony. It became clear that the only way to continue to pass on their worldview to future generations was to turn away from the oral tradition that had preserved it for so long. And so, with the help of English academics who had come to the Great Blasket to study the Irish language, the Blasket islanders produced a series of books. Without that decision, consciously made by men and women who saw it as their duty to pass on the knowledge, values and traditions they'd inherited, the Irish people might well have lost touch with a cultural inheritance that had been preserved by their ancestors across thousands of years. This is Mama Shibulata. 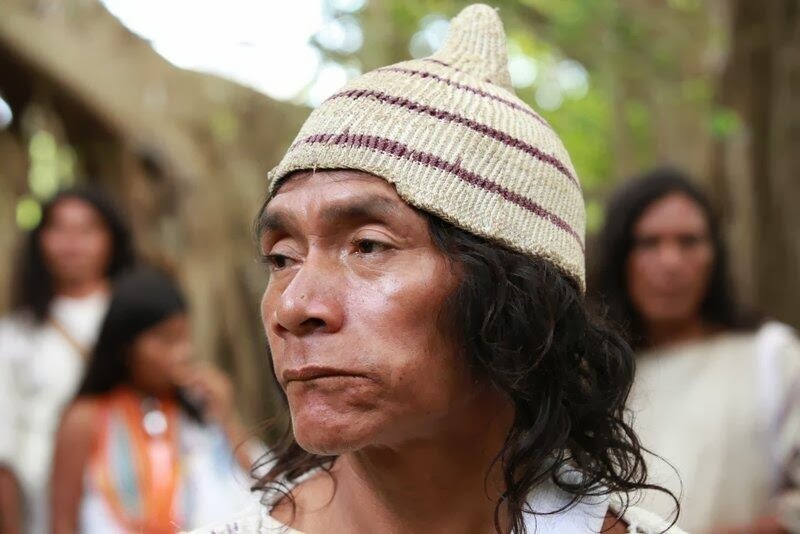 He's a respected elder among the Kogi, an indigenous people of the Sierra Nevada de Santa Marta in Columbia. The Kogi are descendants of the ancient Tairona civilization which flourished in Columbia at the time of the Spanish Invasion. For hundreds of years they've lived in isolation at the top of the highest coastal mountain in the world, having fled from the invaders whom they refer to as 'Columbus'. For generations the Kogi's worldview has been handed down in an oral culture which relies on the power of memory, meditation, shared awareness of their environment, and a profound sense of the place of human beings in a living, interconnected universe. Writing is not part of their culture. Nor is film-making. But, like the Blasket islanders at the beginning of the twentieth century, they believe it to be their duty to come to terms with the imperatives of the times they live in. Over twenty years ago, Alan Ereira, an English documentary film maker made contact with the Kogi and, with their cooperation, produced The Heart of The World, a film which delivered a chilling warning. The Kogi's motivation was simple. They were afraid. They say that the developed world is precipitating a major ecological crisis which threatens Earth’s survival. They believe that we must be made to see and understand what we're doing, and to assume responsibility. Otherwise, the world will die. Now, more than twenty years later, The Heart of The World continues to be shown worldwide, some thirty times last year in the US alone. Yet the steady destruction of the earth’s ecosystems continues. So now the Kogi have spoken again. A new film, called Aluna, has been made. It's been produced by Ereira and this time controlled by the Kogi themselves, from concept to production schedule, content and final edit. The photo of Mama Shibulata that you see here is a still issued by the film's production company. Tomorrow night Aluna will have its Irish premiere in The Blasket Centre, a heritage centre at the end of the Dingle peninsula which looks out at The Great Blasket Island. Ereira, who’s flying from London for the occasion, believes it’s the perfect venue. Though life on the island became unsustainable for its dwindling community in the 1950s, the Irish-language speaking people of Ireland's western seabord still retain a sense of communal memory and respect for oral tradition. To Ereira that heritage is important. He says it’s also important that fishermen and farmers, young and old, will be part of the Blasket Centre’s invited audience, and that their voices should be listened to as carefully in the ensuing discussion as those of the environmentalists, politicians and policy makers. The Kogi are afraid, more so than they've ever been. But they’re also hopeful. They believe that it's not too late for us to hear their warning, and to learn what they can teach us. I hope they're right.